I've heard things mentioned about the economy hurting, jobs are going away, and commuting traffic is lighter. Doesn't seem to have reached the University District. 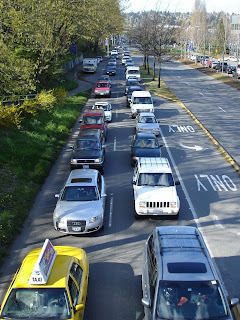 This is Montlake Blvd, heading west to SR520. No accident or event, just afternoon traffic.